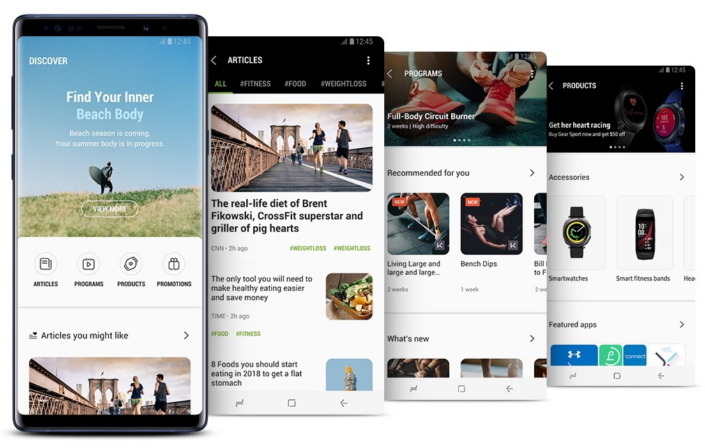 Samsung Electronics today announced a new version of the Samsung Health app, Samsung Health1 6.0, including updated health and fitness tools, a new UI, and increased personalization to empower users to take greater control of their health and wellness. 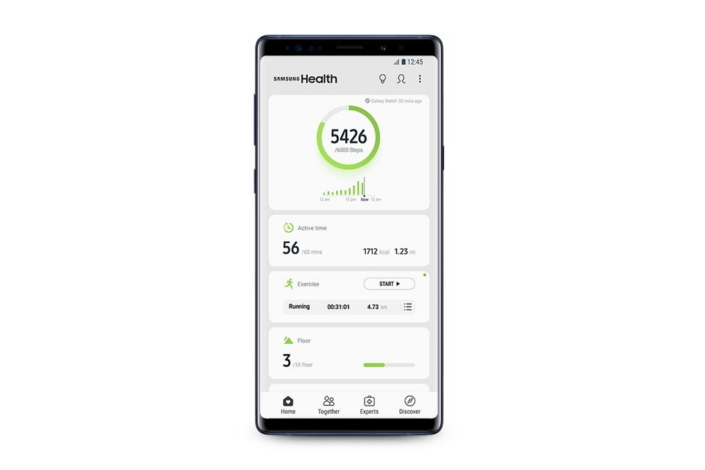 Now with over 65 million monthly active users worldwide, Samsung Health’s next iteration delivers a more personalized digital health platform. With an updated user experience, more user-friendly visual design and new features, Samsung Health 6.0 is more intuitive, interactive, personalized and easier to navigate. Taking user feedback and the latest design trends into consideration, the Samsung Health home screen is now simplified, categorized and prioritized according to the user’s personal needs and habits, so that users can quickly view and access preferred features. The improved ‘Together’ tab now allows users to share photos and celebrate fitness milestones and achievements with friends all within the app. Users can also connect with Samsung’s community of users around the world to exchange texts and photos, compare achievements and encourage each other to do more to reach wellness goals together by participating in the monthly ‘Global Challenge’. The updated ‘Discover2’ tab provides a more tailored user experience, allowing users to easily find health-related content – including articles, programs and partner apps – based on their interests and level of fitness. Additionally, users can now purchase wearables, accessories, and health-related goods and services all within the platform3. Samsung Health is also committed to strengthening its collaboration with partners to expand its digital health ecosystem and provide the best experience to users. Samsung Health now supports a complete set of SDKs for app and web service integration. This enables strategic partners to expand their services and enhance user experience. With the latest user interface and updated ‘Discover’ feature, users can find services quickly and easily, giving partners enhanced visibility of their apps, products, and content4. 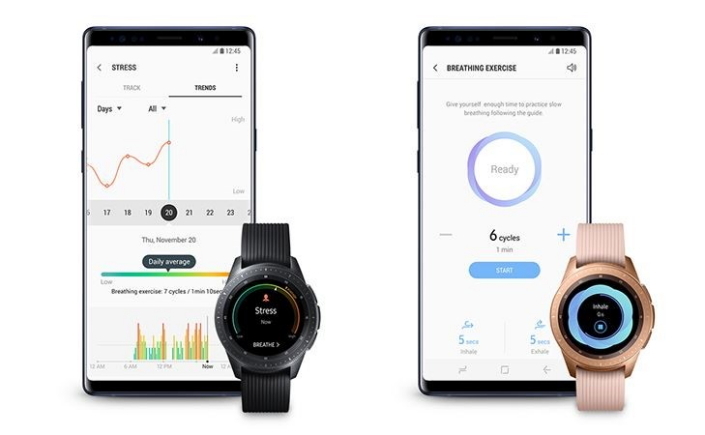 The newly enhanced Samsung Health interface on Samsung wearables and smartwatches features more at-a-glance information, a workout countdown, GPS and heart rate tracking information, all available with the tap of a button. With the latest update, users can now choose from 39 different exercises and track their fitness progress when they pair with a Samsung wearable device or smartwatch. The latest Samsung smartwatch, Galaxy Watch, also allows the application to detect one of the 39 different exercises, and record data even when users switch between activities – such as from running to cycling – tracking the entire workout from start to finish5. Users can get more out of their Samsung smartwatch, even when the workout is over, with Samsung Health’s new wellness and stress management features. With ‘Sleep Stage Detection,’ users can track their sleep cycles to improve sleep habits. Users can also manage stress in real-time through heart rate and heart rate variability monitoring, as well as with a guided breathing exercise program. Samsung Health strives to provide more intuitive and accessible healthcare options for consumers globally. Samsung Health includes ‘Symptom Checker’ and ‘Ask an Expert6,’ which allow users to access medical information, look up symptoms, manage prescriptions and even chat live with certified doctors, all within a single application. Additionally, Samsung Health has built a partner ecosystem with well-known health brands, like Babylon (UK) and American Well (US), creating many more ways for users to improve their health and wellbeing. Since its launch in 2012, “S Health”, a basic nutrition and fitness tracker available on select Galaxy smartphones, has grown to “Samsung Health,” a comprehensive digital health platform. It now includes interactive health features – such as telemedicine, competitions and personalized tips – across a broad range of Samsung and non-Samsung devices. The latest Samsung Health app can be downloaded via the Google Play Store or Samsung Galaxy Apps2 . To find out more about Samsung Health, please go to: http://www.samsung.com/global/galaxy/apps/samsung-health/. Samsung Health is an all-in-one companion for your healthy lifestyle. With Samsung Health, you can track your everyday activities, get coaching to reach your goals, and even connect with healthcare professionals in real time, straight from your phone or wearable device. Samsung Health opens up a global health community by enabling users to compete in challenges or go head-to-head with friends to achieve milestones. Through new technologies, combined with a wide range of partners in fitness, wellness, and healthcare management, Samsung Health offers secure, easily accessible, highly personalized and continuous health management. This reflects Samsung Electronics’ commitment to empowering users and delivering innovations that help improve people’s lives. Please visit http://www.samsung.com/global/galaxy/apps/samsung-health/ to learn more. 1Samsung Health is intended for fitness and wellness purposes only and is not intended for use in the diagnosis of disease or other conditions, or in the cure, mitigation, treatment, or prevention of disease. Tablets and some mobile devices may not be supported. Samsung Health requires Android OS 5.0 or above, iPhone 5 and above with iOS 9 and above installed. Available functions, features and addable applications may vary by region, service provider, and device specifications. 3Product listings may vary by market. 4Samsung Health continues to support all third-party applications using Samsung’s SDK. Data integration of some third-party vendors may not be compatible. 5Continuous tracking is currently available for Galaxy Watch. 6 Service currently available in U.S. and U.K. for Symptom Checker and in China, India, U.S. and U.K for Ask an Expert.